Leadership. Patriotism. Service. It's not just our motto; it's our passion. Investing in the next generation of leaders is also our legacy - YOUR legacy. 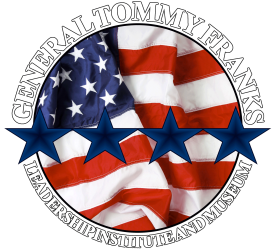 The General Tommy Franks Leadership Institute and Museum was created by General Tommy Franks and his wife, Cathryn Carley Franks, as a historical foundation dedicated to telling the story of the United States military and education. The General Tommy Franks Leadership Institute and Museum invests in the nation's future leaders through several education and outreach programs including the Mobile Classroom + Road Show, the Inspired Leadership Challenge and the Four Star Leadership with General Tommy Franks program. The world-class Museum is housed in a remodeled, 9,500-square-foot building in downtown Hobart, Oklahoma. The facility includes a gift shop, galleries with memorabilia and artifacts from General Frank's personal collections, a traveling exhibit area and meeting facilities. Exhibitions are ordered chronologically, following General Tommy Franks life and career, while also showcasing the changes in the American military from WWII to the present, as told through the lives of soldiers. See cultural items from around the world, unique military equipment, one-of-a-kind historical photographs, and videos and much more. The Museum also houses one of only two Medal of Honor awards in the state of Oklahoma as well as one of the world's largest collections of Challenge Coins. Plan your visit and learn how you can invest in our future leaders. "It is my belief that leaders are not born they are developed, and it is my passion to develop a world-class facility to inspire the next generation of leaders. I encourage you to enhance your own potential by participating in one of our projects and by visiting the General Tommy Franks Leadership Institute and Museum in Hobart, Oklahoma. Thanks and God Bless America!"